ABS-CBN broadcast journalist Korina Sanchez, 54, and senatorial candidate Mar Roxas, 61, begin their new life as parents. Korina Sanchez, 54, adds the tag "mother" on her social media accounts. The Rated K host announced on social media yesterday, February 21, that she and and husband, senatorial candidate Mar Roxas, 61, have welcomed fraternal twins. 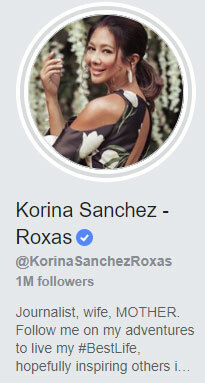 Soon after the announcement, Korina's social media profiles were updated. Her official Facebook page now indicates that she's a "MOTHER." Following the news, Korina posted glimpses of her and Mar's new life as parents. The veteran newscaster showed her husband holding one of their twins in his arms. The twins, a boy and a girl, are Mar's second and third children. His eldest Paolo, 25, is his son by former partner Maricar Zaldarriaga. The senatorial candidate appeared to be hands-on with the parenting tasks as Korina showed his "puyat" look. She wrote, "Kahit lima kami sa bahay, lahat kami may assignment and schedule. Ayan ang mukha ni husband pag puyat sa pag-alaga ng dalawang baby. Dapat lang." Korina also posted a photo of herself with one of the twins. "Andaming nagrerequest pakita daw ng mukha ng mga bata...O sige na nga. Abangan nalang mamaya sa TVPatrol ha? Promise." Korina and Mar are currently in Pennsylvania, U.S. They have yet to reveal more details about the twins, including their names. It was speculated early in the year that Korina and Mar were expecting a new addition to the family. Korina subtly addressed these rumors through an Instagram post showing she was shopping for baby items. It was dated February 19. Korina and Mar got married in October 2009.